Here is a list of Best Free Flyer Maker Software for Windows. These free software let you create a flyer using various templates and a variety of graphics creation tools. A flyer is a kind of print advertisement which is primarily used for sales and marketing to reach out to target audience. It can be in form of menus, cards, pamphlets, brochure, etc. You can also share them digitally to create awareness about your brand and offers. Most of these software contain an inbuilt library of flyer templates to let you modify a template and create a customized flyer. You can also download flyer templates from online and use them in some of these software. Besides that, you can add various elements to a flyer such as images, formatted text, cliparts, objects, shapes, barcodes, QR codes, etc. In most of these flyer maker software, you can also manually draw over flyers using tools like pen, pencil, marker, spray paint, brush, magic wand, fill color, etc. Furthermore, these software provides effects, filters, transformation options, layer feature, etc., to create and enhance flyer designs. These software let you directly print created flyers. Also, you can save created flyers as images (JPEG, PNG, BMP, GIF, etc.) and PDF documents. HP Photo Creations is my favorite free flyer maker software on this list. It provides a nice inbuilt library of flyer templates, various beautiful themes to create a flyer, multiple graphics items, several texts’ presets, and more. You can save flyers locally, print them, or even share them via Facebook, Twitter, email, etc. You may also like some best free Infographic Maker Software, Animated Banner Makers, and Poster Maker Software for Windows. HP Photo Creations is a nice free flyer maker software for Windows. It provides an inbuilt library of stunning flyer templates. You can choose any of the provided templates and modify the flyer as per your requirements. Apart from flyers, it contains a lot of other templates to create various graphics such as collages, postcards, folded cards, anniversary cards, calendars, address labels, newsletters, invitations, photo books, etc. In order to create a flyer using this free software, from its home screen, go to Business menu and click on Flyers option. It will display a variety of flyer templates which you can use. You can find full-page flyers, cards flyers, and menu flyers here. Simply select one of the available flyer templates and click on Print my own button in the new window. It also lets you enable 2D or 3D design mode. A new flyer editing window will open up where you can find all required tools and options to customize the flyer. In the new editing window, you can design front and back of the flyer. It lets you choose a desired layout and theme for the flyer. For selecting a theme and background color, go to the Design menu. Here, you can find various themes based on different categories to apply to the flyer, such as contemporary, seasonal, wedding, love, birthdays, travel, sports, school, pets, holidays, etc. By using its Add Item option, you can add local images, custom texts, and some inbuilt graphics like accents, baby, buttons & badges, banners & ribbons, numbers, religious, travel, love, and many more. Also, for adding texts, it provides text presets like scripts, handwritten, specialty, metallic, effects, etc. You can arrange these items, align them accordingly, and adjust their transparency, border, shadow, and color. It lets you remove or duplicate an item. When you are done creating a flyer, you can preview it and then save the project. Other than that, you can directly print flyers by selecting a printer. Using its Print option, you can also save flyers as PDF documents. It provides a share feature to share your project through link, Twitter, Facebook, Email, or Pinterest. But for that, you need to create an account on its website or RocketLife. Note: Some premium features are locked in the free version of this software. For example, export to images, premium editing features, premium text features, etc. You can purchase a feature to unlock it if you want. SpringPublisher is another free flyer maker software for Windows. You can create a flyer from scratch or use an inbuilt flyer template and modify it as per your requirements. For creation of flyer from scratch, you need to select a standard or custom size and specify bleed size and background color. It lets you add images, texts, shapes, and UPC/EAN, QR Code, and Code 39 barcodes. It provides an option to add a map, but this feature didn’t work fine during my testing. Other than that, you can add and manage different pages of flyer using its Page Manager feature. Individual elements of a flyer can be managed from Layers panel. Besides that, you can customize element properties like position, size, rotate, opacity, filters, border, shadow, noise, etc. After creating a flyer, you can simply print it or save it as an image or PDF. For image, it supports BMP, WMF, EMF, GIF, JPEG, PNG, TIFF, and EXIF formats. While saving, you can select output flyer quality as low (96 DPI) or medium (180 DPI). Note: The free version of this software is free for only non commercial use. Plus, various features like high output quality, download more templates, and other features are not provided in this free version. You need to upgrade to its paid version to use it commercially with premium features. Chasys Draw IES is a free software with various graphics related tools including viewer, creator, and converter. Using its Chasys Draw IES Artist, you can design a flyer. While creating a new project, simply select type of project as “Poster or Flyer”. After that, you can specify image dimension and physical size. You will then be able to view a default design which you can modify to create a required flyer. All essential tools and features to create a flyer are provided in this software. It lets you add images and customized texts to the flyer. You can also manually draw over the flyer using painting tools like brush, pencil, shape, text, magic wand, sharpen, smoother, eraser, snip, crop, pen and path, etc. It also offers various effects and filters to add to the graphic. Besides that, you can find transformation tools, layer features, color adjustment options, etc. A dedicated color palette is provided to select a desired color for different elements of a flyer. The final flyer can be saved as an image like JPG, BMP, TIFF, PNG, GIF, etc. You can even print the flyer. All in all, it is a nice free graphics designing software. Using it, you can create animations, stack photos, animated cursors, static cursors, etc. 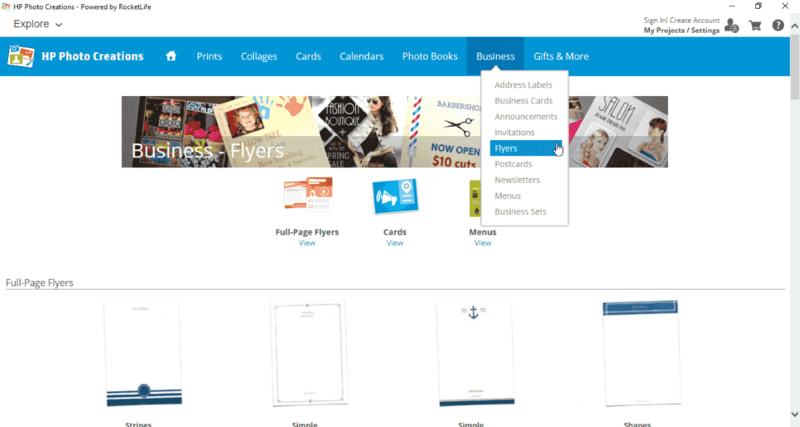 Scribus is another flyer maker software for Windows. It is a free open source desktop publishing software which can be used to create a flyer. To be able to create a flyer in it, you first need to download some flyer templates from here > Scribus Flyer Templates. Here, you can find some free advertisement flyer templates to download. After downloading a flyer template, import it to this software and modify accordingly. It provides some inbuilt templates of brochure, menu, newsletters, business cards, etc., which you can use. Other than that, you can create a flyer from scratch in a custom size. You can add various items to a flyer such as custom texts, scalar & vector images, different shapes, barcodes of different formats, etc. It provides some effects to apply to images (blur, brightness, colorize, grayscale, posterize, etc.). Besides that, you can use various other options like Manage Images, Color Wheel, Hyphenate Text, Short Words, etc. It lets you easily manage each added layers using options like blending mode, opacity, visibility, etc. It lets you export flyers to files like PDF, SVG, PNG, TIFF, JPG, BMP, ICO, etc. Additionally, it provides flexibility to print created flyers too. DrawPad is the next flyer maker software for Windows. It provides some templates to create a flyer. From its Template Wizard, you can access a few flyer templates. Other than flyers, it contains templates for banners, logos, business cards, menus (to create menu flyer), newsletters, etc. In its editor window, you can view layers of selected flyer template which you can modify. You can add texts in custom font, import local images, insert various cliparts, and manually draw over flyer. To draw, it provides several tools like pencil, brush, marker, pen, spray paint, crayon, lasso, magic wand, rectangle, bubble, ellipse, circle, triangle, star, polyline, etc. It lets you select background color, merge layers, set opacity of layers, and do more. After creating a flyer, it lets you save it in formats of PNG, PDF, JPEG, BMP, EPS, SVG, and ICO. Besides that, you can also print created flyer. Note: It is free for non commercial use only. To use it commercially and get premium features, you need to purchase this software. 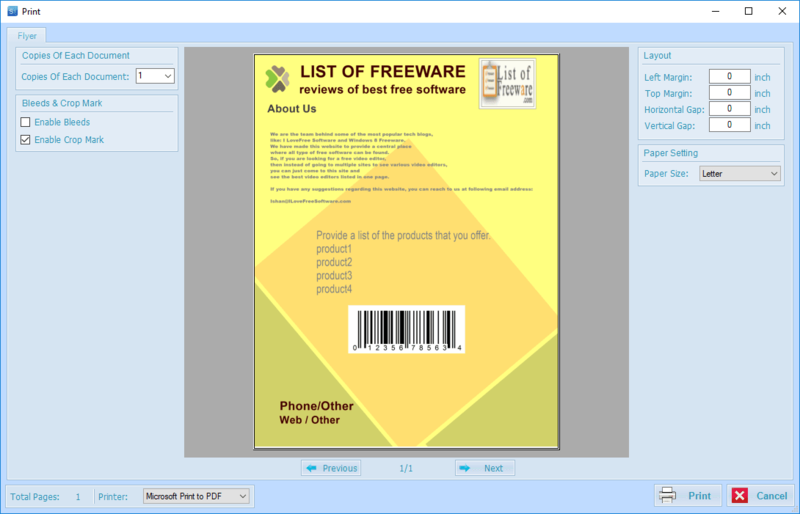 LibreOffice is another alternative to a free flyer maker software for Windows. It is a famous open source office suite with various applications like LibreOffice Writer, LibreOffice Draw, LibreOffice Calc, etc. In it, you can create a flyer by using a template which can be downloaded from here > Flyer Templates. After downloading a flyer template, import it to LibreOffice and modify it with various tools. You can add images, text box, chart, table, date, time, and other objects to a flyer. It contains various drawing tools to manually draw shapes, arrows, line, flowchart symbols, etc. on a flyer. Furthermore, you can enhance flyer by using image effects, a variety of fonts, transform options, etc. It lets you export flyer to file formats such as PDF, PNG, JPEG, etc. And, you can also print the created flyer.